Four years ago Paris was under siege by Erik the murderously vengeful Phantom of the Opera, who swore no one would come between him and his student, the breathtaking Christine Daaé. But a broken heart and a blast of conscience have changed him. Vowing never again to let his curse haunt the diva or the Opera Garnier, Erik is content for the world to believe he is dead. That is, until a good Samaritan begins leaving strange packages, awakening both his deepest desire and most forbidden fear—love. Anna has no way to escape the memories of her past or her bonded servitude to the owners of the Opera Garnier. Ministering to the less fortunate is the only bright light in an otherwise dark existence. 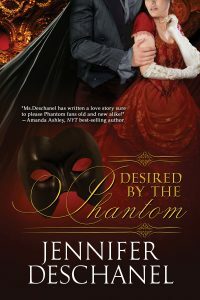 When her kind gesture brings her to the attention of the masked and mysterious Erik, her need for redemption became a desire for true acceptance. But Erik’s powerful obsession with Christine and a deadly con that puts everything she knows at risk pushes her to face terrifying choices. Certain stories transcend time leaving more questions than answers. Readers worldwide have wondered about the nuptials of Darcy and Elisabeth after Pride and Prejudice. Thousands more ponder the life of Harry Potter post Hogwarths. No author made me question as much as Gaston Leroux. My love for The Phantom of the Opera stemmed from a deep respect for a book that was a mystery, horror, and romance rolled into one. It took three solid years of research and revisions to solve those questions and expand his work, but was worth every moment. A writer cannot expand a timeless classic without an impending sense of doom. Doing so challenges readers to view beloved characters in new and compelling ways. Through the years Leroux’s novel has had numerous progeny. Fans of Phantom of the Opera are faithful to the versions they love, be it the musical adaptation of Ken Hill or the film starring Lon Chaney. One thing it seems all Phantom fans appreciate is a deep respect for Gaston Leroux and his vision of a sensual madman. I worked with his characters and crafted my own to expand this timeless classic. Erik didn’t care about the crowds or their stares. He took notice of no one but Anna. At long last nothing else held control of his mind. The freedom was liberating and addicting. To him, nothing existed but music, his opera house, and Anna. The music stopped, but Erik barely could tell over the his throbbing pulse. He stared at her, trying to regain the breath she stole. There were emotions in him he long forgot he had. Exhilaration, excitement… even joy. The effects were too much to take. They were strangling his lungs. “I must go.” Far too many eyes weighed on him. He hastened away; hoping Anna wouldn’t follow, but wanting how she spiraled his heart out of rhythm. The lights of the Escalier dimmed and the sounds faded as he escaped down the vestibule toward the street. Stopping mid-stride, he stared at the doors. It would be easy for him to continue and slip out of sight. Pass through the doors and rescue himself from all his emotions, but instead he turned. He looked beyond Anna, to the crowds that gathered around the marble steps in the Escalier. “Don’t go,” Anna pled breathlessly. The feathers of her costume fluttered against the rosy hue of her cheeks causing a part of his heart to crack. Such a face should not be masked. Stepping up to him, she took his hand and squeezed it slightly. He caressed her with his gaze. The last several months of debating his emotion and torment came forward in his mind. “Ladies and Gentlemen…” the sounds of the masquerade drifted around them. Around her he was a man and a Maestro, part of the human race that had both compassion and dignity. He partook in this charade for one purpose alone. His heart slammed against his rib cage. Her fingers remained entwined in his, and he watched her reaction as he covered her hand with his free one. She looked up at him curiously, but spoke nothing. He stepped toward her causing her to tilt her head back to meet his eyes. How could someone so small fit with him so perfectly? The noise in his head, his warning of madness, faded. Not even the din of the crowd beyond could replace the music. Unsure of himself and his inexperience, he brushed a finger across Anna’s forehead with the inquisitiveness of a child. He’d only kissed a woman once…on her forehead. That had been a magical moment that turned into the greatest hell of his life. In this instance the sordid memories of his past at the opera house disappeared from his mind. His hand trailed down Anna’s face, tracing the wrinkle to her brow, the small creases on the side of her eye, her mouth plumped in a slight pout. One finger came to rest against her lips, finding them as fascinating as any sculpture he’d ever seen. Breathing deeply, he closed his eyes. He couldn’t resist the pull of having a woman’s lips against his nor could he deny the powerful urges such a thought sent racing through his body. Twisting his hand, he tipped her chin. Lifting the purse of her mouth higher and higher, he bent deeply to meet their lushness. For the first time in his life his cold lips brushed against the warm allure of a woman’s. Nerves reached out and squeezed him with invisible hands. His muscles seized at the thought of her pulling away, but her shoulders melted into his grip. He hadn’t expected such a reaction and acted upon it. Tangling a hand in the waves of her hair, Erik fell into his emotion. He kissed her with all the power and passion he had found in their friendship. Though that played in his grip, holding her tightly to him, he kissed her lightly. When he pulled back, he watched as she covered her lips with her fingers and looked away. He looked beyond her again, toward the rotunda. —she had to know all of him. Staring intently at the rotunda, he forced the shallow demand from his mouth. Trembling, she pulled the feathered costume from her face. Anna gasped and dropped the one she held. Her hands shook. Erik crushed a fist to his mouth. He would not cry out. “Do it!” Grabbing her shoulders, he braced himself for her inevitable reaction. Erik’s eyes never left the scene over her shoulder. It had to be done. He couldn’t bear to look directly into her eyes. He heard her crying. He hadn’t meant to frighten her, but he had no choice. She teetered on the tips of her toes before lifting her hands to his mask. Hitching a breath, he jerked his head backward. The heat from her hands coming toward his face skipped his heart as they reacted for his most intimate part. Erik trembled too as Anna’s hands shook when the mask slipped away.